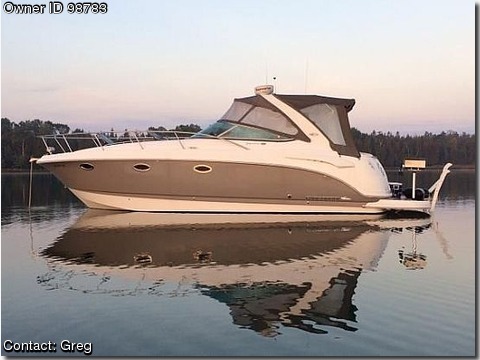 Boat is located in Saint Johns,Michigan.Please contact the owner @ 517-285-four three nine six or 5h(at)charter(dot)net…2008 Chaparral 330 Signature Cruiser. 35 feet LOA, Freshwater only since new. Twin Mercury 350 Mag MPI motors with Bravo 3 Drives. 346 hours currently (may be slightly more as we are still using the boat). Private owner&#39;s stateroom in rear, with seat and vanity. Electric table in front which converts to a berth, side dinette which also converts to a berth. Always stored in heated storage during the winter. Raymarine Color Radar, chart plotter, GPS. You will be hard pressed to find a scratch on this boat. All maintenance up to date and the boat is spotless.